How Much Hair Do You Get in a Set? Are you thinking of getting hair extensions, but don’t know where to start? Whether you want them for a special occasion or to wear every day for thicker and longer hair, we got you covered. Hair extensions can be a big investment. You want to make sure you know what you’re buying, and that you get the best quality possible. You don’t want to spend all that money only to find out that the extensions fall apart. Here’s everything you should consider that will help you find the best hair extensions for you. 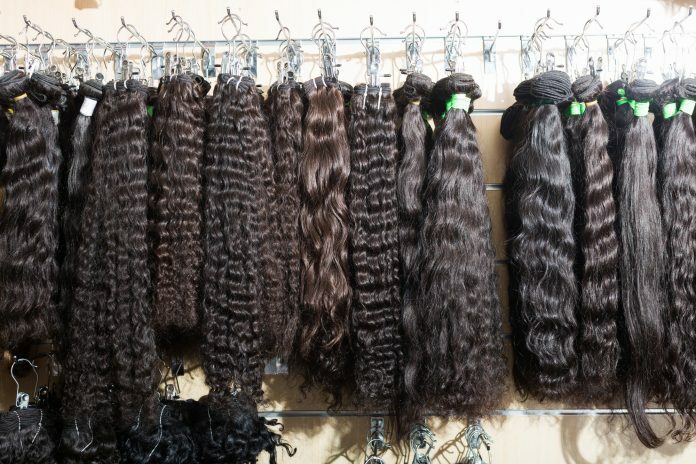 Always check to see if the extensions you’re buying are made out of natural human hair or synthetic materials. Extensions made out of human hair tend to be better as they will not only last longer but will also look more like your own hair and can be treated the same as your hair. While you might not feel comfortable using human hair, remember you cannot heat synthetic hair, which means you can’t blow dry it, straighten it or style it. Natural hair can last with any heat application. If you aren’t sure if the extensions you’re buying are natural or synthetic, simply ask the seller. Check out this article to read more about how to care for and style your hair extensions. And always try to find extra virgin 100% hair as it’s very soft, silky and the highest quality. Virgin human hair is always the best choice because it lasts longer and can last through anything, even rainy days. It will look the most like your actual hair and you can treat it the same way. You can dry human hair extensions, straighten them, curl them, put product in them, wash them, or even go swimming with them in. You can’t do any of this with synthetic hair extensions. Virgin human hair is also the healthiest out there, it’s picked a strand at a time and keeps the ends and roots in the right direction. Also, the cuticles are kept intact and not stripped. Preserving the hair cuticles and aligning them in a unidirectional way, makes extensions that are natural in appearance. This is why it’s considered to be such high quality. The only downside is it’s pricier, but it’s definitely worth it. It’s incredibly important that when you’re picking out your hair extensions, that you find the right color. You don’t want people to know you’re wearing hair extensions. And nothing looks more obvious than hair extensions that are a different color than your real hair. Always compare the extensions color to your natural color until you find the right match. Try to do this during the day, in daylight which reveals all the shades and lets you find the perfect match. If your hair happens to be one-dimensional, try to find a dual blended or tri-blended color for your extensions. Color isn’t the only thing that should blend with your hair extensions, texture also matters. Each type of hair extensions works for several different hair textures. Chinese hair tends to work best with medium dense hair, while Russian hair works better with finer hair. A way to test this is to try on the extensions and if it doesn’t follow the texture of your real hair, it will look messy and unnatural. This is why it’s important to touch your hair and examine it closely before purchasing. If your hair curly, then don’t go with straight extensions. It’s better to have curly extensions for your curly hair, you can always straighten them all together if you’re want that look. Speaking of texture, you’ll also want to consider how much actual hair you’ll get in your set of hair extensions. Some brands can be more expensive than others but have more hair. It’s better to invest in slightly more extensions, then to by a new set every year. Look for sets that have about 7 wefts or pieces. This means you’ll be able to distribute the hair more evenly, which is great if you have finer hair. When you buy a high-quality product, you’re paying for hair that you can wear confidently for a long period of time. You always can not use all of your hair pieces at once, but it can be harder to find more matching pieces if your set doesn’t have enough. Not every length is right for every person. Make sure you pick a length that is right for you. Remeber you always can get the extensions trimmed or cut into your hair. But longer extensions can also be more expensive. So if you have short hair, don’t spend more on long extensions if you’re just going to cut them. Make sure you have a clear vision of the look you’re going for, and where and when you want to wear your extensions before buying them. Ask yourself questions like, is this for a daily look? Or will this just be worn on special occasions? When you buy extensions online, especially if you’re looking for a more expensive product, always pay attention to the quality of the website. You should be able to read about the product before buying it. Always research all the information on the website, and see if you can contact the seller if you have any additional questions. It’s definitely a red flag if the website you’re buying your extensions from isn’t user-friendly or it’s hard to find information about the product. If buying online, choose a vendor that has videos and or user reviews with perhaps pictures, so you really know what you’re getting. If you’re buying you extensions in a store, make sure you find a good and knowledgeable sales associate to guide you through the process. Ask your associate questions about the store and the quality of the hair they use. When matching color, try to do this in natural light if possible. Regardless of where you buy your extensions, make sure you do all your homework and research first, so you know what you’re buying. Don’t rely too heavily on the sales associate to help you find what you need. Often they might just push the most expensive or trendiest product on you for their own agenda, instead of helping you find a product that is the perfect fit for you. What’s the difference between clip-in and tape-in? Which is better? Clip-in extensions are a great option if you’re looking for a quick DIY hair extension routine with no long-term bonding. Clip-ins are easy to attach and match with your own hair. They can give you hair length, lowlights, highlights or add volume. All clip-in extensions come in one or multiple wefts (pieces) or various widths, so you can clip them in or out in minutes without looking obvious. This is the way to go if you want longer hair and don’t want to damage. Clip-ins also allow you to wear them only when you want for a special occasion, so you don’t have to commit to high maintenance extensions which require regular salon visits which can really add up price wise. Tape-in extensions are the latest hair extension trend. Tape-ins are thin tape wefts, about 1 inch wide per hair weft that gets taped in between your own hair and sandwich together like bonds. Today they are the most popular hair extension method in salons worldwide. This method is 100% natural, as it doesn’t require any tools or chemicals, and it lasts up to three months. The hair is also reusable and takes less than an hour to apply to an entire head without any damage. The process is pretty simple, you select a section of your hair in a straight line, remove the backing tape seal and place it under a small section of your natural hair as close to the scalp as possible. It’s suggested to use as little hair as possible, so the sticking of the tape will be higher. You then smooth your hair onto the tape using the end of a tail comb, then take another piece of hair, remove the seal and sandwich it on top of the previous piece. It’s also recommended that you leave your hair unwashed for at least 3 days so the taped hair has enough time to set. Now that you know what’s out there, find the best hair extensions that work you. Be sure to do all your research before buying anything. Always go for natural virgin hair that matches your hair’s color and texture. If buying in the store don’t feel pressured to buy what the sales associate is pushing. Have a clear idea of what you want and go for that. For more information on hair care check out our blog.